Email marketing is an incredibly powerful tool that all commercial real estate professionals should be using to reach prospects, engage them in conversations, and convert them into deals. As a direct connection with prospective buyers and sellers, email has extremely high ROI. The average ROI for email marketing in all US businesses is over 3,000%, with $44 made for every $1 spent. But your emails need to be targeted to the needs of your prospects, highlighting properties and opportunities in which you know they’ll be interested. This is an industry driven by referrals, word of mouth, and the strength of relationships, and email is one of the most effective and lowest cost ways to stay top of mind with your current clients and new prospects alike. Using email, you can provide valuable insights into the commercial real estate market, notify your list about new opportunities, and engage prospects in active nurturing to keep your company top of mind. For these emails to be effective, however, they need to be targeted, well-written and designed to drive opens and clicks. To ensure this is the case and to provide the best possible return on investment for your email marketing efforts, we’ve created a step-by-step walkthrough. In it, you’ll learn exactly what it takes to research, prepare, and execute the perfect email campaign. Below are our top commercial real estate email marketing tactics to help you with your next CRE marketing or sales campaign. Email is a powerful tool that can re-engage lapsed contacts, build relationships with new prospects, and get a deal within feet of the finish line before a sales conversation. All of these benefits, however, are dependent on your understanding of your audience. Broad, generic messaging broadcast out to a massive list of diverse contacts won’t work, so it’s vital you take the time to better understand who you’re contacting and what they need. The Demographics – Step one is the basics. What kind of job titles, seniority, age, and general characteristics do your target prospects share? Nothing is universal but try to get a snapshot of what the group looks like. What Are Their Problems? – What issues, concerns, or questions do these individuals share? Are they focused on location? Price? Condition? Are there other factors that come up frequently in sales conversations? Know these questions and your emails will better reflect your business to the target audience. Where Do They Get Answers? – Where do these people go online to get answers to those questions and solutions to those problems? Get a sense of the commercial real estate websites they use, social media platforms they are members of, and blogs they read. By knowing the three things above, you can paint a more detailed portrait of your ideal prospect, and your emails will be much better for it. Broad, generic messages that are broadcast out to a massive list of diverse contacts doesn’t work anymore, so it’s vital you take the time to better understand who you’re contacting and what their interests are. Segmenting your contact list is by far one of the most powerful things you can do. Unfortunately, it can also be the most difficult and time consuming. Done right, however, segmentation of your contact list can help you to pinpoint key targets within segments of your list with messages that resonate. Your giant one-size-fits-all email list could have hundreds or even thousands of prospects who all have specific needs that are unique to their situation. Sending every one of them an update about specific properties doesn’t work as well as segmenting and sending targeted messages. A good list might look like “Retail Buyers – Warm Prospects – Boston”. The naming conventions can vary depending on your system and how you like to organize things, but the key here is breaking things up to be easily searchable and super targeted. The goal of list segmentation is to adapt content and messaging to match each segment. Prospects in Boston and Washington DC deal with different issues on a daily basis and will respond to different messages in your emails. The same is true of people in different types of organizations, job functions, and levels of seniority. A good email list is not necessarily large – it is targeted, primed, and maintained. It’s better to have 500 contacts who have opened your emails, engaged with your content, and actively sought out your expertise than a list of 5,000 contacts who have never heard of you, or who haven’t opened an email in more than a year. Clean Your Lists Regularly – When an email address changes, your messages will bounce. Those emails often remain in the database for months or even years past the point at which they can be reached. Remove them when you spot a bounce. Purge Unsubscribes – If someone unsubscribes, remove them from your email list. As spam and privacy laws tighten, it’s more important than ever to clear these people out and not attempt to contact them. Check for Activity – No contact is ever truly gone, but there are certain thresholds you can watch. If someone hasn’t replied to an email or engaged with your content in more than 12 months, consider removing them, or setting up a cold-nurture campaign to attempt reengagement one last time before deletion. No matter how clever, enticing, or perfectly designed your email is, if the subject line doesn’t capture attention and drive clicks, it’s not going to work. A good subject line is your first impression with a prospect. It’s the first (and in many cases last) thing they read from you, and it needs to do a LOT of things to be effective. It needs to trigger interest, avoid looking like spam, seem personal, and most importantly drive action – in this case an opening of that email. On the flip side of the coin, what fails more often than anything else? Marketing messaging. With the exception of obvious spam, these are the messages most often ignored by readers. Not because they don’t accurately describe the content of the email or call the reader to action, but because they are vague and familiar – the same kind of mindless content they see on a hundred websites throughout the day. In other words, this is not the kind of stuff they want to read when working through a busy inbox. Are you ready for X? They’re vaguely spammy, formulaic and not descriptive of the specific reason they benefit the reader. Worse, they are impersonal in a way that just doesn’t work in an email inbox. At the same time, be as specific as possible. Avoid vague, potentially annoying email titles like “quick question” or “for the correct contact”. Be specific, ask a clear question and get to the point. That’s how to get your email opened. Another common factor that directly impacts open rates is subject length. 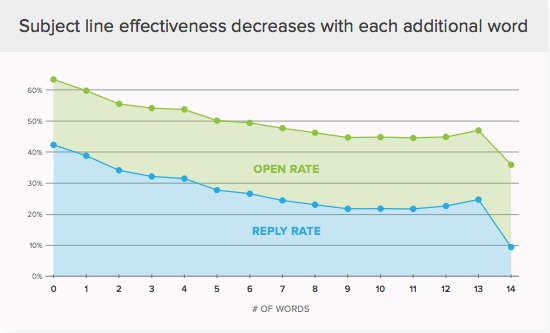 Specifically, subject lines with 1-3 words perform better than shorter, succinct headlines. Why? There are a couple of reasons. First, shorter usually means more personal. When was the last time you wrote a 7-word subject line in capital case to your mother? You probably wrote something like “checking in” or “pictures of kids”. This is how people communicate and it’s the type of emails people respond to. Another factor here is the mobile component. People read 40% of their email on a mobile device first, and most mobile devices can only display 4-7 words of the subject line. Go too long and it’s not clear what an email is about. A surefire way to get dumped in the trash. Because it’s a personal touch that engages people to take action. Even if they don’t really know who you are or recognize the email address, they won’t risk not responding to an active conversation. How does this translate for commercial real estate emails to your prospects? The same rules apply, but there are certain things you’ll want to keep in mind. There are several bits of “common knowledge” when it comes to email send times. After all, if you can get your email in front of prospects at the right time, they are going to be less busy and more likely to open. But how do you know when the best time is when there are so many conflicting bits of advice out there? Conventional wisdom says that business emails should be sent between 9am-6pm Tuesday-Thursday. Avoid Mondays when people are overwhelmed and Fridays when people are checked out. But in reality, because everyone does this, the vast majority of business emails are delivered between 11am-4pm on Tuesday, Wednesday and Thursday. That’s a lot of volume in the middle of the week. 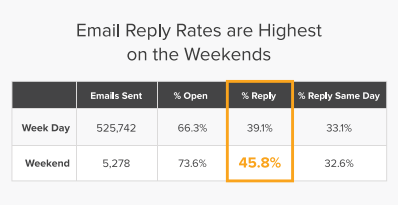 A recent Yesware study showed that both open % and reply % were higher on the weekends than during the week. Which makes sense when you consider most people put off low priority tasks like email backlog for the weekend. Much like day of the week, the vast majority of emails come through in the same 4-5 hour period each day. And yet the highest open rates tend to be very early in the morning or late in the day, again when people are most likely to address their backlog. Use an email scheduler to send your messages when even you might be asleep and you’ll be surprised at the higher response rates you get. Nothing is more frustrating than preparing an email, finely tuning it for your audience and then seeing that a high percentage of people didn’t even receive it. There are plenty of things you can do to ensure your emails get where they belong, including some simple, non-technical steps you can take right now to reduce the likelihood they are seen as spam and boost the number that get into the right inboxes. Did you know every email you send can be seen and tracked by ISPs to ensure you don’t represent a high spam threat level? This is a good thing, though, because it means we can see that data. While some of this can represent technical issues you’ll need outside help to address, checking your Sender Score can ensure you are aware of the issues and do your best to address them. Sending Consistently – When emails go out in erratic spikes, you might see higher rates of rejection and a lower overall sender score. Sending consistently over time is an important way to avoid this. Ensure Your Contacts Are Opted In – The last thing you want is for someone to flag your email as spam. If someone isn’t sure why they’re getting an email from you, that’s a bad sign as it can quickly lead to high spam rates and eventual blacklisting. Only send to people who have requested information from you, and use a double opt-in and email confirmation process to avoid this issue. Clean Your List Regularly – On a regular basis, remove bounced emails, unsubscribes, and other non-deliverables from your list. When you send to these and they bounce back, it can trigger a block or filters on your emails to all addresses. Use an email validation service that will check for inactive accounts as well as duplicates, old domains, records that have requested no messages, honeypots designed to catch spam bots, and other issues that could hurt future deliverability rates. For a commercial real estate marketing campaign, email is one of the most effective tools at your disposal. Which is why it’s so dangerous to send emails that might spike your spam rate or put you on a blacklist that drops your deliverability rates. Be mindful, carefully prune your list and send smartly to avoid this happening. If nothing else, remember that follow up wins deals. Even the most robust and effective email marketing campaigns can be run aground by a lack of follow up. The average email is opened within a day of sending it 91% of the time. That means only 9% of emails opened are opened after a full day has passed. They get buried in unmanaged inboxes and never seen again. And while it’s easy to assume these lost emails are intentionally ignored, the simple truth is that the average business user receives between 100-150 emails per day. If something isn’t deemed important during a particularly busy period of time, it will fall into the abyss quickly. So a strong follow up strategy is a must when prospecting via email. Yesware has a recent study that shows that more than half of first replies only came after the 3rd email was sent, and more than 30% weren’t seen until the 7th email or more. It can take several follow ups over the course of several weeks to get a response. Don’t give up so easily. When contacting cold prospects or those you haven’t spoken with for some time, automation can ensure better follow up over the long term with scheduled sequences. Those that can be updated based on engagement are even better, escalating prospects that open or click an email vs those that do not. All the best practices in the world mean nothing if your target doesn’t open the email at the time targeted. Vary your outreach time if you don’t get responses during normal business hours or weekdays. Move to weekends, late nights, or off hours to see if there’s a gap in their schedule that makes response more likely. If someone doesn’t open your email, it doesn’t necessarily mean they are not interested. They could be out of the office, didn’t see the email, or were too busy to read or reply when it was sent. Most people don’t empty their inboxes, so once it’s missed, it’s unlikely to be seen again. To counter this, resend emails to non-openers a week later with a new subject line. Finally, for your email efforts to be effective, you need create a marketing report to know what works and what doesn’t. A surprisingly large number of CRE professionals rely on that gut feeling of business being better or worse to determine if their efforts are actually working. But it’s important to know not only what works but why it works, when it works, and what changes had the greatest positive impact. Track key metrics for your emails – For each of your email sends, you should know the open rate, reply rate, and click rate on any links included in your message. Segment based on email type – The data for personal emails sent from your CRM will be different from marketing emails and newsletters sent via autoresponder or marketing tools. Measure each separately to make smarter decisions based on that data. A/B test your headlines – For emails going to larger audiences, don’t be afraid to test different types of subject line. If you are contacting several hundred prospects at once via autoresponder, try a handful of different headlines to see which perform best. Software that supports A/B testing in a single batch is even more effective because you can keep all variables static except for the subject line. Measure change over time – Track how your metrics change over time based on the changes you make to your campaigns. If you implement a new template, how does this impact your response rates? A pretty new template that drops your open rate by 15% probably isn’t worth the visual upgrade, for example. An effective trick that works well for prospecting is to send your emails to multiple people. Specifically, by sending the email to one person directly and another via CC, you can improve your open and reply rates by as much as 12%. That’s a big boost and generally improves your likelihood of someone in the organization you’re trying to reach getting the message you’ve sent. When speaking with prospects, always ask if there is anyone else that should be included in the email. This will help in the long term. Even if you land on a formula that works effectively and drives good open and click rates, it could be better. Statements vs. Questions in Your Subject Lines – You’ll see data from both sides on whether a question or statement works best. In reality, it’s all about your audience and what they find most engaging. Test your messages with simple tweaks to the format. Timing of Your Messages – While there is a benefit to be had to sending emails in off hours, such as the weekend, you should always test to be sure. Make sure it actually works as intended by testing against a more common time or day. Personalization – Test several different formats of personalization in your emails. Specifically, you should test use of merge fields in your subject line, salutation, and the call to action at the end of the body of your email. A well-constructed email marketing campaign that pays close attention to the most effective strategies for getting prospects to open, reply to, or click on links in your emails will almost certainly have a positive impact on your business. The more prospects you can engage with a simple email, the more robust your pipeline will be and the more active your sales reps will be engaging with those prospects. And it all starts with understanding what works and what doesn’t and making smart changes to improve your results. Thanks for awesome tips. I’ve recently started using marketing automation with GetResponse and I guess these strategies still can be applied in some scenarios. I find A/B tests very important and try to use them as often as possible. The headlines and subject lines were always a challenge for me, so A/B tests help to see what works better. Remail.io is a much cheaper alternative with the same functionality it helps my team.